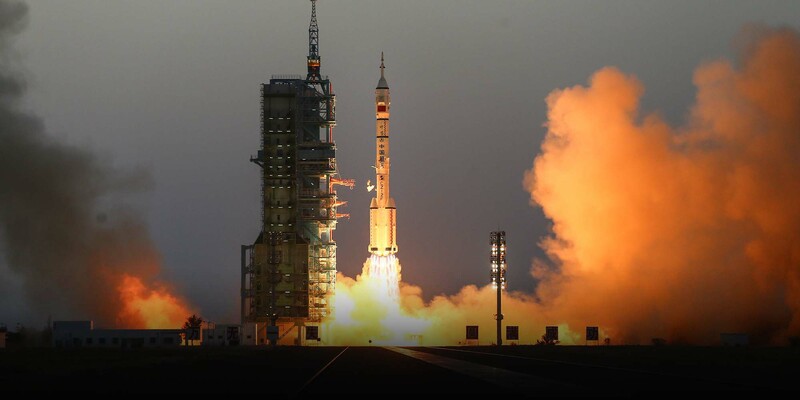 This morning, two Chinese astronauts blasted off into space. These are some of the people who made the project possible. Bei Fang is the pen name of a staff member at the television station of the Jiuquan Satellite Launch Center. She has worked and lived in the center for 14 years. A few hours ago, two astronauts boarded the Shenzhou 11 spacecraft at China’s Jiuquan Satellite Launch Center, and blasted off into orbit. They are bound for Tiangong 2, the space laboratory that successfully launched on Sept. 15 from the same site. They will dock at the lab for 30 days. China’s only launch center capable of testing manned spaceflight is located in Gansu province in China’s barren northwest, 300 kilometers away from the nearest prefecture-level city, which bears the same name. The area is flat and sparsely populated, with annual temperatures averaging 8.5 degrees Celsius. While most would find the climatic conditions here deplorable, such a climate creates an ideal natural environment for space launches. At Jiuquan, test launches can be carried out about 300 days per year. I have had the privilege of working at Jiuquan for well over a decade. My colleagues are driven, hardworking individuals with excellent credentials in their fields; they are also people with eclectic and sometimes complex personal backgrounds. On a historic day for Chinese aerospace, I want to provide insight into the lives of the people behind the launch. Xie Hu has been working at the space center for 14 years. Now 37, he says he has become accustomed to the intensity of aerospace work. As the software development manager and testing group leader, the buck stops with him if the launch site’s command display system doesn’t run smoothly. Several years ago, when he took on the managerial role, Xie’s workload was frighteningly heavy. Surrounded all day by millions of lines of code, he routinely logged workdays of 15 hours or more without going home or eating. Empty boxes of instant noodles piled up around his office. Sometimes, if he was lucky enough to get some downtime, he would rest on an inflatable mattress next to his desk. People usually hit their physical peak around age 27 or 28, which made it easier for Xie to go several days without sleep. Yet his health still deteriorated: Within two years, he came to weigh more than 100 kilograms. “I ate a lot of instant noodles during that time, and wasn’t working out, so I gained weight really quickly. My physical fitness weakened to the point where I couldn't even run 1 kilometer,” he says. Jogging out beneath a starry sky, he follows the potholes of the bumpy mountain road. Day after day, he runs his ‘one-man marathon,’ clearing his mind before the long workday ahead. Xie also suffered from anxiety related to his job, which was compounded by pre-existing clinical depression. He weathered sleepless nights and became obsessive-compulsive about checking that simple tasks had been completed — such as making sure that he’d locked the door at the end of his shift. Xie still found fulfillment in his job, but eventually he couldn’t ignore what his body was telling him any longer. Fortunately, he discovered something that helped him relax completely: running. His newfound hobby allowed him to cut loose, and he lost weight, too. In 2012, a much-trimmer Xie took leave to travel 1,000 miles to Lanzhou, the provincial capital of Gansu. There, he participated in the first international marathon of his life, a mark of his personal transformation. In the following years, he ran marathons across the country, from Xiamen in China's eastern Fujian province to Dalian in the northeast. At the Dunhuang International Marathon in Gansu, he even finished in the top 50. When a 50-kilometer cross-country race was held three years ago in Jiuquan, Xie discovered another form of running. While international marathons in China’s big cities satisfied his need to relax, running through the calm expanse of the Gobi Desert afforded him a more profound communion with nature. Now, cross-country is his sport of choice. These days, Xie sets off at 5 a.m. sharp. The sun has not yet risen, and the Gobi remains shrouded in darkness. Jogging out beneath a starry sky, he follows the potholes of the bumpy mountain road. Day after day, he runs his “one-man marathon,” clearing his mind before the long workday ahead. Running has gone a long way toward addressing Xie’s insomnia and depression. He has lost more than 30 kilograms, and feels happier, more attentive, and more decisive. Most importantly, it has helped him cope better with the pressures of the job at Jiuquan. 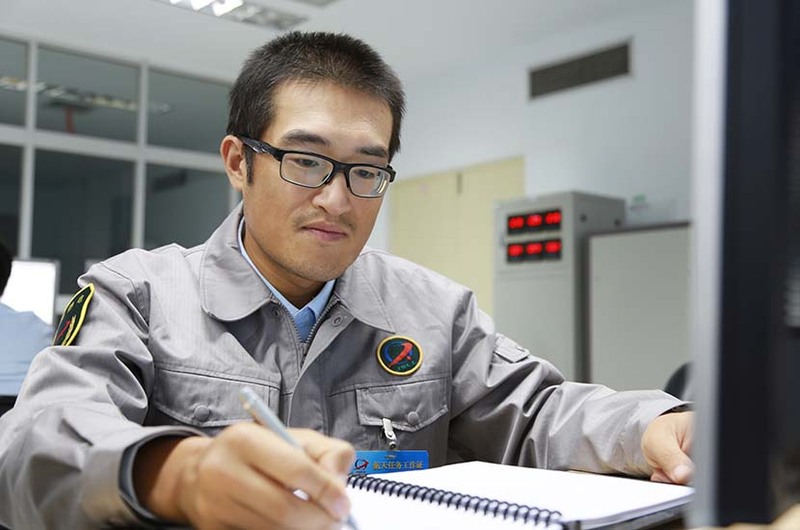 Prior to the Shenzhou 11 launch, Xiong Xianchao and his colleagues were preoccupied with conducting repeated quality checks on each piece of equipment in the filling control room, located less than 100 meters from the launch tower. The 35-year-old director of the rocket propellant filling division seemed deeply worried. Propellant filling is a dangerous task that requires meticulous attention to detail. The highly flammable nature of the fuel means that the slightest oversight could result in tragedy. Two major launch failures — the Falcon 9 rocket in the U.S. and Long March 4C in China — occurred on the same day not too long ago, both related to faulty rocket propellant. It is Xiong’s job to ensure that a similar tragedy does not befall Shenzhou 11. Having led the manufacture, development, and installation of the filling control system, he helped to synchronize it with Tiangong 2 before its launch. The expertise required by Xiong’s role goes beyond a familiarity with the fuel system alone. The practicalities of day-to-day life at Jiuquan mean that his team often has to draw on a wide variety of different skills. Only when we fully understand our core competencies can we fully appreciate where and when to apply them. This is the softer side to working at the launch site. We can’t always rely on others to fix things for us. Xiong led a huge upgrade of the entire filling system over Chinese New Year. Early on, a bug kept plaguing the software. Convention dictated that in such a situation, the team would have to consult the technical staff at the factory, but they were all away for the holidays. As a satellite mission urgently required Xiong and his team to get the software working for the first day back, they were unable to wait. After brainstorming overnight, they simply fixed the software themselves. Xiong knows the value of being able to think on his feet. “Only when we fully understand our core competencies can we fully appreciate where and when to apply them. This is the softer side to working at the launch site. We can’t always rely on others to fix things for us,” he says. The tranquility of the launch site is calming for Xiong. Sometimes, when he works into the night, the desert skies fill with rose-tinted clouds stretching all the way to the horizon. Often, when he gazes upward, it seems as if the entire Milky Way is draped over the site. His colleagues regard him as a humorous, upbeat person with an easy smile, no matter how stressful the work. He approaches even the most mundane, everyday tasks with unexpected humor. There has been little time for joking around over the last few days, though. The impending launch had Xiong running around with thick rolls of schematics, checking and rechecking each detail with great care and poring over thousands of software codes. There will be time to rest later. For now, “doing my work to the utmost ensures that the launch will go smoothly,” he smiles. Xiong jokes that he’s one of the old guard at the launch site now, as most of his colleagues are — perhaps surprisingly — under 30. 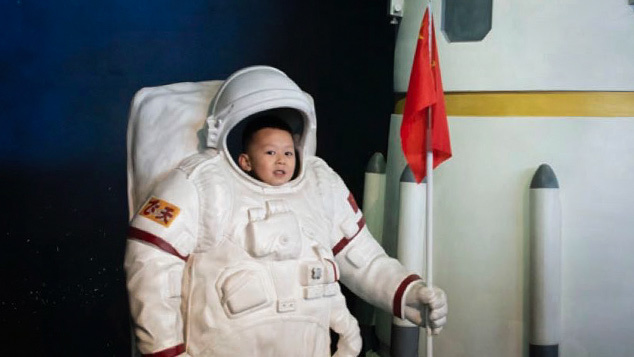 According to a 2015 official report, China is unique in that 75 percent of its aerospace crew is under 35 years old. 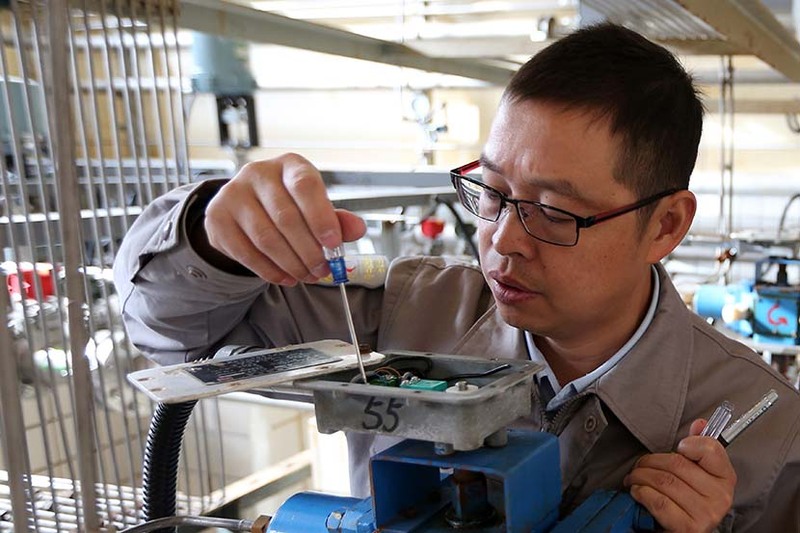 At only 35 himself, Xiong has nonetheless started thinking about who might take over from him: “I’ll consider it a success if I can leave this job with a sense of ease.” He currently has his sights set on Li Meng, a recent graduate. 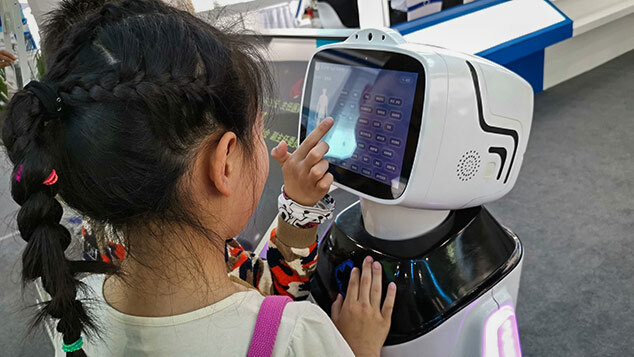 Wiry and small, 27-year-old Li recently finished his master’s degree in computing at the National University of Defense Technology. Despite his youth, he rarely feels the pull of the bustling cities out east. Instead, working at the launch site often leaves him with a feeling of awe. It seems likely that Li will get that chance. His mastery of various skills has already made him an invaluable asset to Xiong’s team, and his superiors have been impressed to see him take to the role so consummately. The launch center at which Li has cut his teeth is vastly different now from the way it looked in the 1970s, when China started testing its first satellites. Since then, Jiuquan has acquired a hotel, a hospital, markets, schools, and other facilities that bring the conveniences of modern life to this remote corner of Gansu. It may not compare to the glitz and glamour of the country’s big cities, but for our community of rocket scientists, it is home. Observers of today’s launch will see a country dreaming of reaching the heavens and becoming a powerful nation. I believe that the accomplishments of my colleagues at Jiuquan are a worthy source of national pride. That pride is felt by everybody in this community who has contributed to the launch in some way. When their achievements are taken together, they are a testament to humankind’s drive to explore and understand our universe.